It's such a loooooong time ago, but I'm gonna start blogging again! Last week I received a E-mail from Matt. which is a part of Become.com's blogging network. 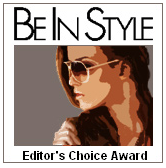 He offered me to receive the E-award "Editor's Choice Award". It's such an honor to receive this from this online blogging network! Matt made me a button and I really really love it! This button inspired me to keep on blogging! Matt, you really made me happy!